WOW, I am SO checking this book out!! Now I'm excited to read it! I'm so getting these books for my daughter and me. I like to be wooed on page one of a book, or at the very least by about page 15. There are some books I'll give a little longer if it came highly recommended, or I already know the author, and I know she always comes through for me eventually. I like to be wooed on page one, but I'm willing to give authors a chance because if I'm not used to their "voice," I may love it later on. I used to finish books solely 'cause of the "finisher" in me. It's like I felt guilty if I didn't see the thing through. That might've been my goody-two-shoes complex rising to the surface. Would you please stop posting reviews like this!? My Kindle is full of books to be read, and I've already spent too much on books lately. Now that I've read this I MUST buy this book too. Shame on you! A monster is coming and it will never go away hungry? DANG! Why can't I write hook lines like that?!?!? Okay, you sold me, Jess! I put it on my TBR list. I'm anxious to read it now. I tend to give authors a chance. Mostly if I have bought their book, I feel compelled to have to finish it. Even if it is semi bad. Not sure why. Maybe I keep thinking it will get better. I find that if it is recommend to me and i buy it because of that recommendation, or if it is a best seller, I tend to keep going even if it's dragging a little. Sometimes the books will get better as I read sometimes it doesn't. 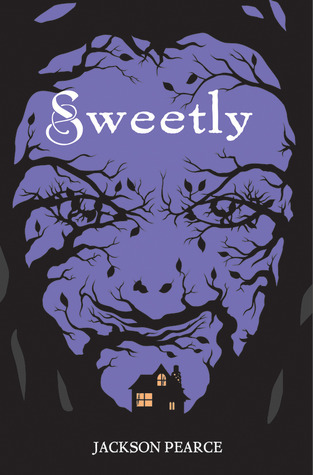 Can't wait to check out SWEETLY! P.S. Yep-the cover is fabulous!! That is a pretty awesome cover. It reminds me of when I was little. We lived near these woods with very old oak trees. Sometimes I saw faces in the trees like on the cover of this book…I remember the man with a mustache. Anyway, I give an author a chance…I found some real gems by just reading into the book instead of just a chapter or two. Reading a book now that didn't grab me big time on page one, but I liked the plot on the back blurb enough to stick with it. Glad I did. Had me crying last night. Oooh, werewolves. I might take a peek at this series 😉 Perhaps when your daughter's a little older, you can enlist her to help you with book reviews! I try to give a book the benefit of the doubt and keep reading, even if I don't like it initially. I'm one of those readers who believes in holding until the end. There were a couple that I had to put down after ten pages in, though. I read Sisters Red and enjoyed it. Thanks for the heads up! YA isn't normally my genre, but this book sounds really good! I may have to pick it up. New twists on classic fairytales are hard to do. As for what kind of reader I am, I give the story about 5-10 pages. If I see clunky prose or dialogue, I'm liable to shorten that. My reading time is limited, and there are a ton of books on my list. I sound like a snob, but it's the truth, lol. Thanks for sharing the book with us! i'm willing to give them a few pages to wow me…but if by chapter one, i'm not completely compelled to read further, i usually don's (unless by some misfortune i've signed up to be an influencer, and then usually i'll keep reading and find things about the book that i like). but that's just me. i might just have to check out Sisters Red…. I'm the typical "Look at the cover, the back cover copy, and then flip to the first page" kind of reader. I will give the author the first page … maybe the first chapter if someone said, "This is a great book! You've got to read it." That said, if a book doesn't grab me right away, I often put it on the shelf (or nowadays I store it in my Kindle.) Sometimes I come back and find on a second read that what was ho-hum one time is now a fun read. That cover is totally amazing! Creepy amazing!!! I write for a bit younger age group, but I'm sure they want to be "wooed" with the first few words–and the cover art too. Thanks for sharing this, Jessica!